This past weekend I had the pleasure of meeting Richard Hinojosa, Executive Chef at The Wigwam Resort & Spa, an Arizona landmark for over 80 years. Chef Rich’s passion for food, attention to detail and vast experience in both resorts and restaurants provides the foundation and leadership for The Wigwam’s talented culinary team. He has been recognized with several awards throughout his career and most recently was one of the top 4 restauranteurs in the valley to raise the most money during the city's "Flavors of the Valley" competition. Nearly $60,000 was raised during the three month campaign as each participating Valley-based restaurant featured a special dining promotion with 100 percent of promotion proceeds benefiting two local food banks. As a top fundraiser, Chef Rich and his team will join Chef Eddie Matney and his famed Eddie’s House in the “Flavors of the Valley” showcase, hosted by Valley GMC Dealers, at TNFL’s Party with a Purpose® held on the eve of Super Bowl XLIX on Saturday, Jan. 31, 2015 at WestWorld of Scottsdale. In our conversation this weekend Chef Rich shared with me the recipe he will be preparing for the event. In anticipation of close to 4,000 attendees Chef Rich was looking for something that would come together easily and highlight local ingredients. His Beef Carpaccio below does just that. In a sauté pan, heat canola oil over med-high heat, when very hot sear the exterior of beef all around. Quickly. Remove, sprinkle with fresh chopped thyme and let cool. When cool enough to handle, roll tightly in plastic wrap to help shape a good cylinder. Freeze until very cold, and firm but not frozen solid. In a small saucepot, bring the sugar and water to a simmer, allow to turn into a dark amber caramel, be very careful not to burn. As soon as the caramel is dark amber in color, add the soy sauce, be careful, it will rise, so add 50% and swirl around, then add the remainder. Stir well, make sure all of the caramel dissolves, remove from the pot to cool, spoon off any impurities. Thinly slice the red onion, set aside. In a small container(Tupperware), add the very hot water, then the salt and sugar and mix well until they dissolve completely. Then add the vinegar, let cool slightly and add the onion. Cover and let sit overnight, or up to a week. In a saucepot, bring water to a rolling boil, add a generous amount of kosher salt, then add the asparagus, cook for about 20-30 seconds, just until barely tender. Remove the asparagus to a bowl of ice water. Let cool completely, then toss with olive oil, salt and pepper and char quickly on a grill. Dice into small rounds. Wash the potatoes, then slice very thin on a mandolin into water. Let them sit for about 15 minutes, remove from water, pat dry with a towel. Fry in canola oil at 350 degrees until light golden brown and crispy. Remove from oil, season with salt, set aside. Thinly slice the firm beef on a slicer if you have one, if not, carefully with a sharp knife. Lay the desired number of slices on a plate. Brush with olive oil, sprinkle with salt and pepper and a little sea salt. Randomly drop circles of kabayaki, and hot mustard, lay one or two medallions of crab on top of the beef, sprinkle the asparagus, stand a few chips up on the beef, and finish with slices of pickled red onion and thin sliced scallion. Serve. 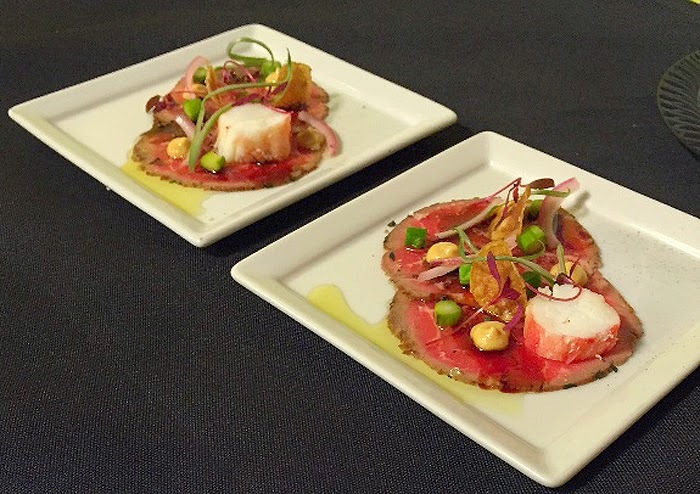 I first fell in love with beef carpaccio when I worked at a restaurant in my early twenties. I've never made it at home, but that needs to change. Great recipe, Theresa! This recipe looks fun to make. My son is a die hard carnivore thanks to all of the growth spurts lately so we may have to try this one out on him. That looks so perfect. It looks perfect for the event. That is one perfect looking piece of beef! I absolutely love carpaccio...this looks delicious! Oh my, I wish I was there to give that a try! $60,000 raised to help local food banks is fantastic! The beef carpaccio looks pretty tasty, too. Wow! That is a beautiful recipe!! YUM! I want to give this gorgeous recipe a try! Sounds like a great event and for an even better cause.